The 6 S system is a modified version of the Lean Manufacturing principle of 5 S. Developed by Taiichi Ohno, an industrial engineer for Toyota, Lean Production is a systemic method designed to optimize the efficiency of a business. The 6 S system is a modified version of the Lean Manufacturing principle of 5 S. Developed by Taiichi Ohno, an industrial engineer for Toyota, Lean Production is a systemic method designed to optimize the efficiency of a business. Lean was born from the more specialized Toyota Production System, which is a system that helped Toyota grow from a small automobile manufacturer when it was founded in 1937 to where it is today: one of the largest manufacturing conglomerates in the world. The Lean way is to eliminate wasteful practices in manufacturing, and focus on optimizing those practices that add value. The 5 S principle is one of many that fall under the Lean Production umbrella, but it is also one of the most important when it comes to eliminating waste from a system in order to continually improve that system. The original 5 S of Lean are Sort, Straighten, (or Set in Order) Shine, Standardize, and Sustain. The S added to these for the 6 S system is Safety. These words signify a method by which manufacturers may increase efficiency in their processes and also continually improve them, as is the Lean way. 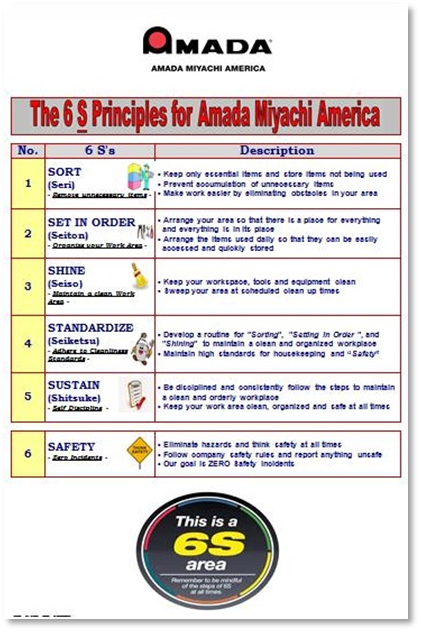 AMADA MIYACHI AMERICA (AMYA) believes wholeheartedly in the Lean principle of being committed to continual improvement, so they recently made a change for the better and put the 6 S method into practice. First, here is an explanation of the 6 S principles. The first S is Sort. To sort, in the context of manufacturing, is to identify the waste in the manufacturing process, identify what is causing that waste, and then to remove the causes of that waste. For example, to remove all unnecessary tools, components, equipment, and other miscellanea from the workspace would be to sort that workspace. The second S is Set In Order (Straighten). After sorting possible wasteful items or activities, the next step is to set them into order, or straighten them. There is a place for everything, and everything should be kept exactly in its place. In other words, to set in order is to organize. This is the goal of the second S.
The third S is Shine. Once the workspace is clear of all unnecessary equipment and is organized in a precise fashion, the next step is to clean the workspace. This may include a thorough cleaning of all equipment, the floor, ceiling, etc., but also may include new paint for the walls and other aesthetic changes. The goal of this sanitization is chiefly to bring the workspace to a new standard and to instill a sense of pride for the workspace in those who use it. The fourth S is Standardize. After sorting, straightening, and sanitizing a workspace, the next step is to standardize that process of sorting, straightening, and sanitizing. This is done by establishing a common methodology for carrying out the first three steps of the 6. For example, this could include establishing consistent and exact tasks assigned in a standard way to the individuals in the workspace and creating checklists for these tasks to ensure they are carried out. The fifth S is Sustain. The culture of the organization must be changed in order to ensure that the gains experienced via the first 4 S are continued into the future. First, one must measure progress in the work space under 6 S against the original baseline condition. This progress under 6 S must be continuously measured and recorded. A project plan which details the rollout of 6 S across the entire team, division, organization, etc. is another step to work towards sustainability. The sixth S is Safety. Safety sits above the other 5 S, and involves looking back on the initiatives and processes developed and optimized during the 6 S adoption process and ensuring that they remain safe and are designed to minimize risk. These 6 S were recently adopted at AMYA. As is company policy, AMYA practices continuous improvement every day. 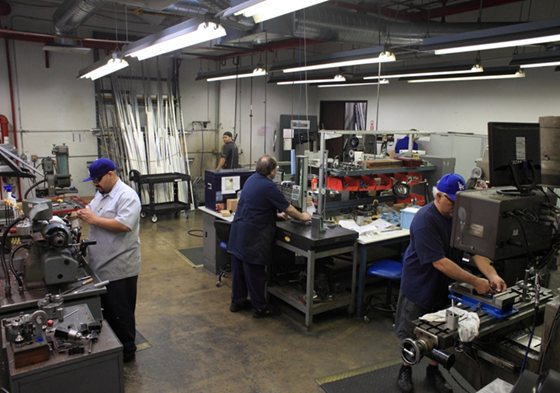 Their goal is total customer satisfaction through excellence in all areas, including manufacturing, plant efficiency, quality, and organization and cleanliness. Their policies and goals have always aligned perfectly with the 6 S principles. 4 years ago they found assemblers on their manufacturing team to be time-inefficient at their processes due to having overstocked toolboxes. They knew they needed to eliminate this waste. They were also changing manufacturing facilities around this time, so they saw it as the right time to make substantial changes and fully embrace the 6 S principles. The first step in this process was to sort (the first S of the 6) the assemblers’ workspace by creating an index of, all equipment necessary to assemble their Resistance Welding products and Laser System Machines on a daily basis, and removing all other equipment, tools, etc., to store elsewhere. 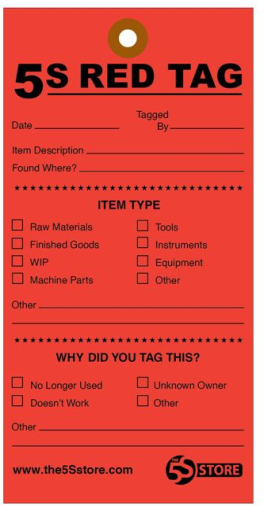 This was done via a red-tag system in which, during a special 2 hour period at the end of each month, assemblers were instructed to attach red 5 S tags (pictured here) to any tool not used on a daily or weekly basis and place it on a large rolling table purchased specifically for the purpose of collecting unused tools. A free lunch was offered to the department that could tag the most items that were unnecessary in their work areas and fill up their rolling table. These tagged items were reviewed a separate team, who decided how and where these tools should be stored and arranged. The next step was to set in order and straighten the workspace. 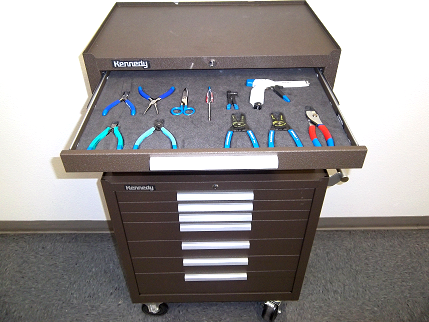 AMYA purchased all new, matching tools and toolboxes to place in each work cell throughout the systems manufacturing area. They also installed foam inserts with cut-out spaces for each tool into every drawer of every toolbox. With this complete, every tool had a specific spot in every toolbox where it could always be found if not already in use. With the work area set in order the next step was to shine. To this end, AMYA purchased 14 brooms, dustpans, and broom closets, as well as several battery-powered vacuum cleaners, to be distributed throughout the systems manufacturing workspace. To ensure the standardized use of these items, they created a system of audible bell signals which signified to assemblers to clean their work cell. These signals sounded 5 minutes prior to each of the three breaks given to assemblers throughout the day and once 5 minutes prior to the end of the day. In addition, the custodial crew was instructed to polish the floors of the systems manufacturing area periodically. To standardize the changes they have committed to, AMYA has invited employees to meet with management on a regular basis to provide feedback on the organization and cleanliness directives. They have also placed posters detailing the 6 S system around the work areas, to remind employees of their commitment to it. AMYA has sustained their efforts to optimize manufacturing via training. They encourage their employees to be self-starters and to take pride in their work and their workspace. This encouragement is helpful, but the main impetus for instilling this pride is in the 6 S process itself, and by implementing it, our employees are taking pride in their workspace efficiency largely on their own, without much need for encouragement or extensive training. The last of the 6 S principles is safety, and it has not been forgotten. As AMYA has undergone these changes to their manufacturing work areas, their focus has been to eliminate hazards, maintain clean and organized work areas, and be safety minded at all times. As AMYA were adopting the 6 S principles, they created a new policy requiring that employees working in the operations group be issued steel-toed boots and a uniform shirt. This policy was put in effect alongside the existing policies requiring the issuance of work gloves, safety glasses, and other personal protective equipment. In addition to the new equipment, a policy was put in place which requires AMYA company department managers to meet with their staffs once per month minimum to train them on specific safety topics as well as to host open discussions to allow for bottom up suggestions, ideas, and complaints pertaining to workplace safety. The results of adopting the 6 S principles as part of the work culture at AMYA have been positive. Their manufacturing plant is noticeably cleaner and more organized. They have received numerous compliments. Some of their customers include military device manufacturers, medical device manufacturers, military aerospace, and commercial aerospace, and when these customers and others have gone to visit their facility, they have been complimentary, commenting that it is one of the cleanest facilities they have ever been in. Insurance providers have also complimented AMYA on their safety protocols and improvements. Another positive result of adopting the 6 S principles has been measurably increased efficiency. By their metrics, AMYA’s efficiency has increased overall by 5% in the manufacturing department. AMYA expects these results to continue into the future, and will continue to follow the 6 S principles and train their people to be proud of their efficient and effective workspaces and processes. Continual improvement is of key importance to AMYA, which is why they decided to take up the Lean mantle and adopt 6 S. In the spirit of Lean Production, AMYA will continue to look for ways to eliminate waste and emphasize practices that add value to their business, and ultimately and most importantly, to their customers.